This is a great time to be out on the Texas Wine Trails, harvest time has begun and so has the fun of this experience. 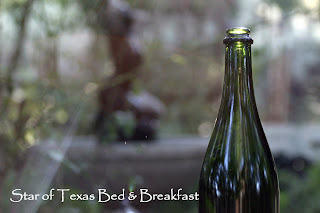 Come stay with us at Star of Texas Bed and Breakfast to enjoy a peaceful night sitting on your private porch sipping on your favorite Texas wine you purchased along the trail. Each winery has it’s on unique tasting room and of course it’s own unique wine to taste. This time of year, there are special events at each winery along the way and you can check out all the events at Go Texas Wine. Come to the Texas Hill Country and enjoy the vintage of Texas. This entry was posted in Texas Wine Trail by admin. Bookmark the permalink.